Tchaiko graduated from Columbia University before going on to intern for Spike Lee and Mira Nair. While assisting directors George C. Wolfe and Tom Vaughan she directed several short-form projects, including America's Shadows: HIV Risk in Black & Latino Youth. In 2012, she wrote the script called Solace, which would eventually become her feature debut. At that time, it was a semi-finalist for the Sundance Writers Lab. In 2015, the project became a recipient of the Panavision New Filmmakers Program. Solace premiered at the LA Film Festival 2018, winning Special Jury Mention Best Ensemble Cast. Tchaiko was a 2017 School of Making Thinking resident fellow where she created the VR film Shapeshifters. In between her independent projects she produces and directs commercials and branded content. The movie that Tchaiko has chosen to discuss this week is the wonderful, wacky, goblin-y, Labyrinth. April and Tchaiko touch upon the arousing gender fluidity of David Bowie's character "Jerith." Tchaiko talks about how she strives to make "imperfect" films. She also elaborates on being inspired by nature in the writing of her next fantasy film. Plus, there's a lot of puppet talk - from the construction to the puppeteering itself. If you love Labyrinth, you will love this discussion. You can watch the trailer for Tchaiko's feature Solace here. 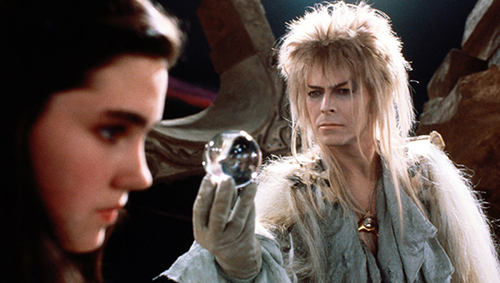 If you haven't seen it yet, go watch Labyrinth. With April Wolfe and Tchaiko Omawale.